WOW! A product that works! U tried these for the first time & I totally love them! With having cats who love looking out of the blinds, these make it easy to repair the slats that get broken. I use them to fix the Vertical Blind . These work precisely as advertised! I fixed four blinds in less than two minutes. Our dog had knocked against these (which is how they broke in the first place), and one came lose and fell, but no damage! Just clicked it back into place. Well worth the price. Recommended. I love this product! It saved me from having to replace the vertical blind panels! The only "trouble" I had was the fact that one side of my blinds are textured and I needed to use a dab of crazy glue and clamp the repair tab for a short time. I tried several fix-its to resolve issue of broken vertical blind tabs. Was somewhat skeptical about this product but, I have to say, it works! Because the tabs are clear I now can't tell which blinds were broken! Great product for the price. Thank you! Used the repair tapes to repair the vertical blind in my living room. Great product will buy from seller again. I have tried creating my own tabs using plastic and tape only to have them fall with the heat. This is great, quick and saves money. Easy to use. Durable. Works on most materials. Never used on cloth blinds. Friends want them. These repair tabs are great! So easy to apply, and very sturdy. Beats having to buy new blinds. They look alot better than those metal clip repairs that are sold and the hardware store. Live in an apt. The shades face the sun and get dried out. This is great so I can repair myself! Thanks! I was consistently calling the maintenance crew at my apartment complex to bring me a new vertical blind; to the point of embarrassment. I now repair my own blinds and the tabs are stronger that the original blind attachments. I have not had to replace one blind that I have repaired. Work great and look great. These work great! Easy to use and very strong. We fixed all of my daughter's vertical blinds and you can't even tell we had to repair them. These worked like a charm on my sliding glass door blinds. This particular door, leading to backyard, gets plenty of use and this little device keeps the broken blind in perfect place. Very happy with this purchase. Great value. I'd recommend these to everyone!!!! I use them on my blinds and fit perfect. They save me from having to replace all the blinds. Very useful. This is a awesome product. Fixes the blinds instantly. This is a life saver, thought I would have to buy a new set of blinds. Vertical Blind Repair - Works great! Repairing the blind with transparent shipping tape didn't work, as it would not lock into the tab. These repair tabs are sturdy enough to get the job done. I could NOT find them in any store I looked in. The blind could not have been repaired with out them. I have vertical blinds in my breakfast nook that cover the sliding door out to lanai. These blind tabs have always been loose and blinds fall off upper attachment. These little tabs fixed the decades old problem and now I can use my slidder without having to reinstall the blinds. The blinds weren't broken just always loose. Instead of throwing out the blinds we were able to repair the top and re-insert them in the heading. 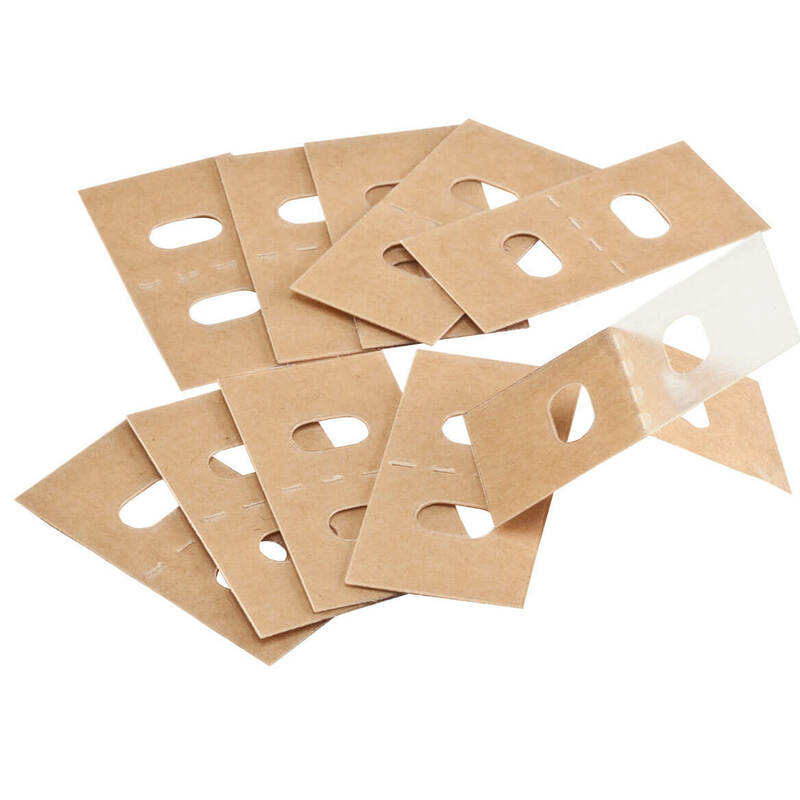 These vertical blind repair tabs are fantastic. I just used another one last nite. Just stick it over the torn area at the top of the blind, making sure the holes line up, and press together. You now can reinsert the blind into the hanger. Fantastic! They come in light tan paper,peel off the paper,they are then clear,put in back of your Vertical blind.This is the second order,they work great on the ones in my sun room!I have a large sun room,that is why I needed more of these. What is great about the repair tabs is that I don't have to replace the vertical slats which would be very costly compared to the cost of the repair tabs. I have 3 cats who constantly want to look out of the front room window. With this, the blinds sometimes get twisted and break off of the track. These tabs have been a life saver, not to mention cost effective by not having to replace my blinds! These tabs are handy for fixing tears in verticle blinds. I don't know what I would do without them. Purchases the tabs to fix a few broken blinds that kept falling off of the hooks. Now they stay up on the rail great. Wish I would have gotten them sooner. Great product. My verdical blinds looked so depressing with the fallen blinds. Repair kit was perfect and easy to use. I will order another set to keep them handy. We like this product to repair the blinds and this useful product helps to keep our privacy during the day and especially through the night. "My blinds are finally repaired"
Nice to finally have our blinds repaired and totally useable. Tabs installed very easily and work perfectly! Very happy with them. Constant in and out by large dogs had snapped on of the slats in our vertical blinds. They are on a large patioi window. This simple repair saved me from having to replace them. I haven't actually used them yet but it's going to be used on my shower curtain not on blinds. I love the curtain I have but 2 of the holes ripped and I feel these will work very well. I did replace blind repair and stick tighten as good holding. I think it is a marvelous product. Trying to find individual blind replacement is almost impossible. To replace we had to buy the whole unit which is quite expensive. This product solves the problem with less expense. I would recommend this to my family and friends. Easy to apply and does exactly what it is suppose to! These were so easy to use. No instructions necessary, and I didn't have to wait for 6-8 weeks or spend a lot of money replacing the blinds. I bought the package 4 years ago and we used the last one this evening. 10 of 17 blinds have been repaired. Have never replaced a repair tab! Very strong! Blind/tab #1 has lasted through 3 small children and 2 dogs!! Ordering another package now to have on hand to repair the remaining blinds when needed.HIGHLY RECOMMEND!! it does what it say, it's great! Terrific Item - would highly recommend! As a person with two "DOG DAUGHTERS" I needed help since they are constantly in/out of the vertical blinds which often causes the blinds to break off at the top. 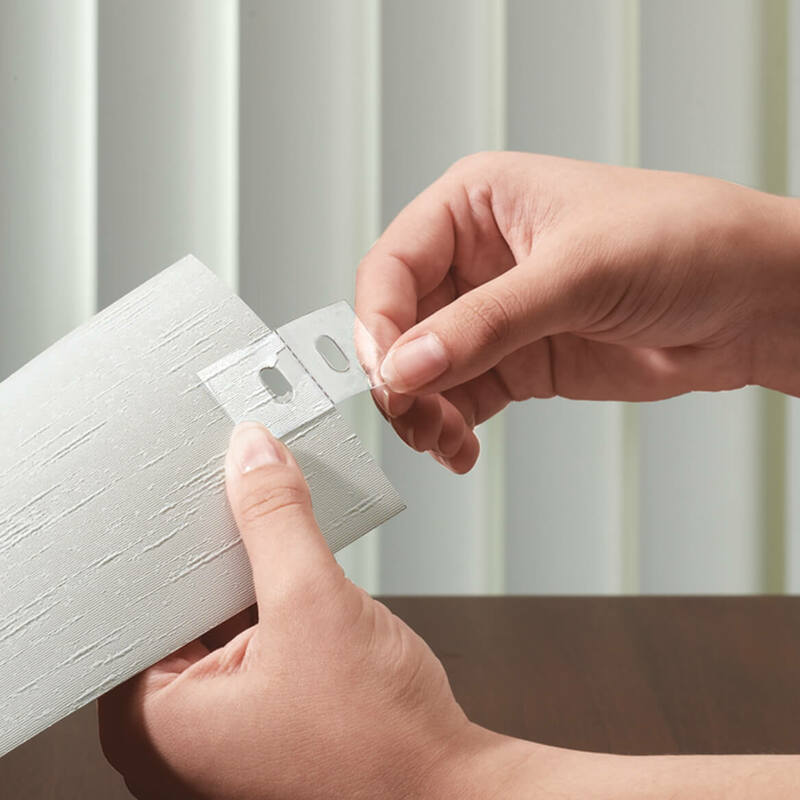 These vertical blind repair kits are terrific--fixed every broken blind. I highly recommend this item. I have vertical blinds and several of the blinds have to be repaired where they connect to the clamps. This will work for me and the tabs are easy to work with. Have used these for many years. Because I have vertical blinds that break at the tab at the top, all the time. Cause that's what my husband wants for Christmas. Crazy, huh? The handy man who works at my apt bldg. recommended them. Have a couple that keep coming off, and I did not want to replace the total shade.. I don't need these right now, but buying them just in case. I have 2 large vertical blind windows and you just never know when you'll need these. Think of them like a fire extinguisher, you'll want it when you need it. On occasion the toddler in the house plays with the vertical blinds so I want to be prepared if a blind breaks. Wanted to try and repair vertical blind. This is the only place I can find these things. None of the stores carry them. repair some older vertical blinds I have and price was decent. Have used this item before. It works well. Have had these before and they are really great for repairing the vertical blinds in our house and rentals. Much less costly than replacing blind vanes. These are great to repair the vertical blinds. They are wonderful. Have used these repair tabs in the past with good results, hence ordered more when needed!! Used at Mom's and was easy to modify and successfully installed. my cat ran through my blinds and one is being held up with duct tape. My mother lives in a senior housing complex that charges $2 to replace a vertical blind slat. I worked with window coverings several years ago and was aware of the tabs. I searched every where and finally found them in your catalog. This is my second order since I am now fixing several of the slats for my mother's friends. These people are on a fixed income and can't afford to be nickeled and dimed. Vertical blinds snap at the connector. Need the repair tabs. needed this product. didn't know such a thing existed. Because all the tabs keep breaking on my blinds and I rent my apartment. We have some blind panels pulled out from rod, resulting is torn tops. Hope this works so we don't have to replace the whole blind. I've used these tabs before, great solution! Are they water proof? My shower curtain all ways tears at the holes. BEST ANSWER: Thank you for your question. The repair tabs are not water proof, they will eventually come off the blind if wet. We hope this information will be of help to you. These look great and I will order them! However, I am in need of the little plastic holders these are pushed up onto. I have several where one of the two ears are broke off. where do I find replacements for those parts???? please help. BEST ANSWER: Thank you for your question. Unfortunately, we do not have information on where you could find those. We hope this information will be of help to you. I need an "L" shaped bracket that holds a front piece on a vertical blind ? BEST ANSWER: Thank you for your question. Unfortunately we do not have the L shaped bracket. We hope this information will be of help to you. Do you have the part that goes on the blind track that the blinds snap into? I can't seems to find them anywhere. BEST ANSWER: Thank you for your question. At this time we do not have the clip that goes on the track for the blind. We hope this information will be of help to you and apologize for any inconvenience.